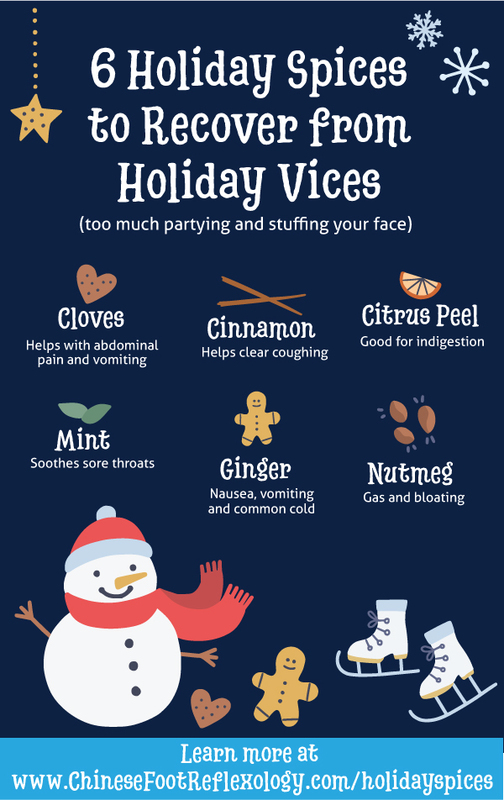 Here’s a fun article where you’ll discover how holiday spices have amazing healing powers. 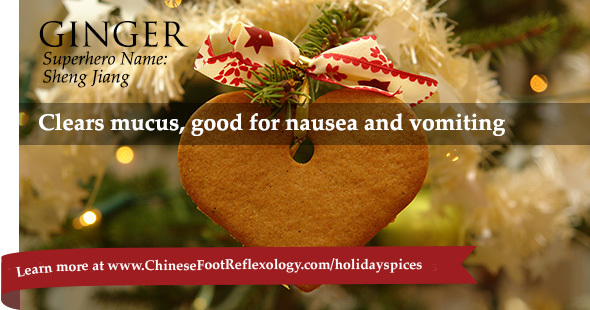 Many of the spices in your kitchen pantry are powerful medicinal herbs in Traditional Chinese Medicine. Be amazed at how festive flavors are not only tasty, but also incredibly beneficial for your health and well-being. Ginger is found in dishes all over the world from stir fries to curries. It’s also the most important ingredient for…GINGERBREAD houses! Plus, ginger is essential for yummy, warm, melt-in-your-mouth molasses cookies. I’m not really a sweets person, but molasses cookies are most definitely my favorite cookie. So how can something so yummy and versatile be good for you? Well, ginger, whose Chinese Medicine superhero name is Sheng Jiang, has two amazing healing powers that are especially good for holiday get-togethers. In Traditional Chinese Medicine (TCM), ginger is considered to be a warm herb that enters the Lung meridian. When I say, “warm,” this doesn’t refer to the temperature of the food. Instead, this temperature is a property of Chinese medicinal herbs. Think of it like balancing yin and yang within the body—or in Western holistic terms, like balancing acidity and alkalinity in the body. You want the body to have the right “temperature” because it’s not good to be excessively hot or cold. Because it enters the Lung meridian, ginger is very beneficial for the Lungs. The warm temperature helps alleviate the common cold—especially one that you get in the winter months. Winter colds are typically an “invasion of cold” from a Chinese Medicine perspective, so you need the warmth of ginger to counteract the cold. Ginger also helps break up constricted Lung Qi that can cause mucous to gather in the lungs. Ginger’s second superpower is that it’s good for relieving nausea and vomiting due to “stomach cold.” What’s that you may ask? Well, this is where there’s too much “cold” in your stomach. It’s a stomach virus, but you’re more susceptible to stomach upset when it’s cold outside and you’re consuming cold beverages—or eating too much eggnog-flavored ice cream. Ginger enters the Stomach meridian to help combat the cold and make you feel better. Another holiday classic is cinnamon. You can’t make gingerbread cookies (or molasses cookies) without cinnamon. It’s also a tasty addition to hot apple cider, eggnog, and my favorite tea: chai. Cinnamon’s superhero name is Gui Zhi, pronounced gway jur (like you’re about to say the word, jury, but without the y at the end). Similar to ginger, cinnamon is considered a “warm” herb, which makes these spices together, a superhero duo for battling the common cold. Cinnamon benefits the Heart and Lung meridians, so it helps warm and soothe your chest. 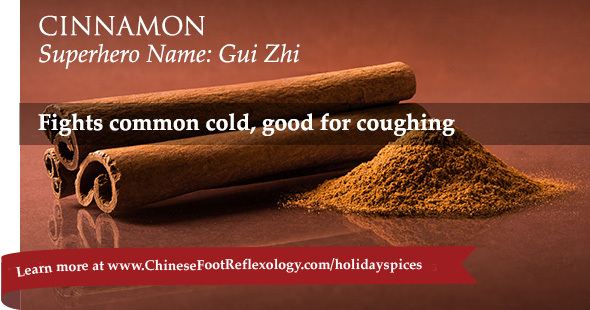 This spice is especially beneficial during wintry weather when you’re coughing and have phlegm inside your lungs. Let’s add another superhero to Team Super Spice Holiday Heroes. Okay, that team name was super lame. Let’s just say my superpowers for coming up with clever names has gone on holidays early. Anyhow, this featured festive fighter is nutmeg, aka Rou Dou Kou. It’s another warm spice, and this one is especially good for digestion. 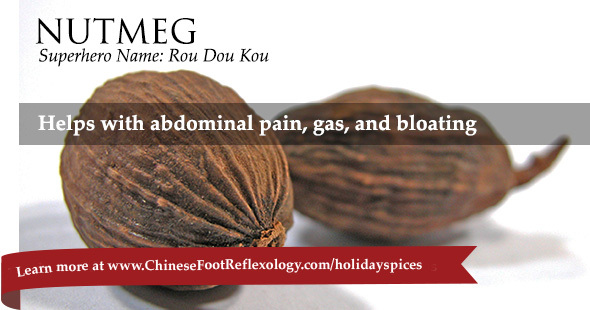 Rou Dou Kou helps alleviate abdominal pain and discomfort, bloating, and indigestion. The holiday season is when we get together with family and friends. When we get together, we eat! And often, we eat too much. For readers of my blog who live in the northern hemisphere (myself included), it’s also wintertime. This potent combination of too much food and cold weather is Team Super Spice Holiday Heroes’ nemesis. Fortunately, many traditional meals feature these very beneficial spices. There’s one more spice that belongs in our super hero lineup of warm holiday spices, and that is cloves. Of all the spices, clove’s Chinese name sounds most like a superhero name. Well, in my opinion it does. Clove is known as Ding Xiang, and the English translation is spike fragrance. C’mon, it’s got “spike” in its name. Cloves are a warm TCM herb that enters the Spleen and Stomach meridians. Cloves also enter stomachs in the form of hot apple cider, eggnog, gingerbread, honey-baked ham, and super tasty chai. 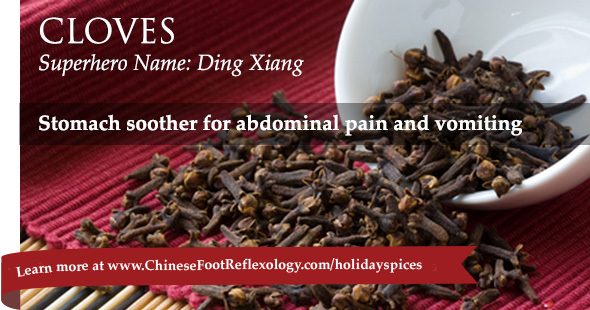 Cloves are an excellent stomach soother for abdominal pain and vomiting. Mint can be found in tasty treats like peppermint hot chocolate, peppermint bark, and candy canes. But keep in mind, in this format, mint is a treat. To get the healing benefits of peppermint, have a soothing cup of peppermint tea. It’s the perfect antidote for sore throats, or when you’ve eaten too many greasy, fried or spicy foods. Mint is like the anti-superhero superhero. Think Will Smith as Hancock or Ryan Reynolds as Deadpool. They did good deeds, but in a way that was different than mainstream superheros. That’s because mint—superhero name, Bo He—is a cool herb. It counteracts heat in the body, so it’s beneficial for soothing the heat and pain of a sore throat. 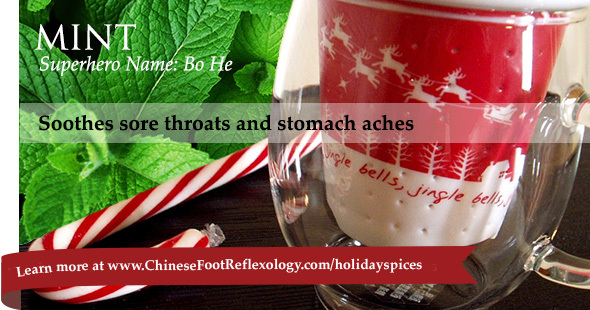 Mint also helps soothe what is referred to in Chinese Medicine as damp-heat accumulation in the abdomen. While damp-heat accumulation usually happens in the summer, this condition can also arise from eating too many spicy (as in hot sauce spicy) foods or foods with hot properties such as alcohol, chocolate, and greasy fried foods. Who doesn’t love a little citrus peel in Christmas cake? Okay, we can debate about the merits of Christmas cake, but orange zest is a popular addition to many holiday dishes, including a vibrant cranberry sauce. 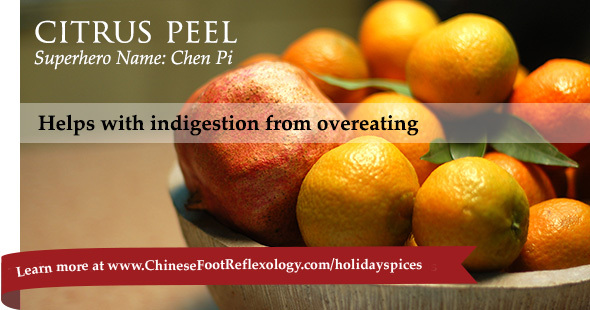 Chen Pi refers to dried citrus peels, and more specifically orange and tangerine peels. Talk about an awesome superhero name! It’s just two letters away from Chun Li, the badass female fighter from the video game, Streetfighter. Citrus peels belongs to a category of Chinese herbs known as qi regulating herbs. Qi, aka life force energy, is supposed to flow smoothly and abundantly throughout your body. When qi is not flowing as it should, qi regulating herbs can help redirect qi so that it flows in the right direction. Orange and tangerine peels target the Spleen and Stomach meridians, making them ideal to help with indigestion, gas, and bloating. When you overeat, it can feel like you have a giant lump of coal sitting in your belly that’s not digesting. This lack of movement in the digestive system is referred to as food stagnation in Chinese Medicine. The excess food is disrupting the proper flow of qi and hindering the digestive process. The remedy is to get the qi flowing again, which is why citrus peels are great for improving digestion. And that concludes our festive tour of holiday spices. Try not to get into too many vices over the holidays :). I hope you enjoyed this article, and I wish you a very happy holiday season and an amazing New Year! P.S. Spread some holiday cheer by sharing this article with family and friends. Simply click one of the buttons below. Thank you for sharing this article. It helps me get the word out on the amazing healing powers of Chinese Reflexology.